Students are back in schools, private lessons are starting again, weekly choir rehearsals are just around the corner, and the new program year is upon us! The program committee made up of David Cason, Kathy Fehrmann (Sub Dean), and myself have been busy the last month putting together the final touches to our events. We open our season with a Hymn Festival, celebrating hymns and organ and choral music. A ice cream social will provide chapter members a meet and greet time as well as an opportunity for outreach to the wider music community. Grab your Halloween costume and invite all of your friends for our “Organ Spooktacular.” The concert will be an organ demonstration, highlight “spooky” pieces for organ that fit the season. All ages are invited to attend, especially young organ and piano students! We will join our neighbors, the Hutchinson AGO Chapter, for an opportunity to share your “Favorite Voluntaries.” The event will take place at Bethel College Mennonite Church on the recently renovated Moeller-Dobson organ. Members are invited to play one piece and suggest two more accessible voluntaries to the group. After a busy holiday season, we will have our annual Epiphany Party at the home of Pat Walcher. This will be a great social event. In February we have the opportunity to listen to David Cherwien (organist) and Susan Palo Cherwien (author) talk about hymns, look at text and text writing, and arranging hymns. Details on how to make reservations will be given later. Our own young organists will present a recital in March. These are students that have received scholarships and/or attended Wichita POE 2015. We will hear our “Rising Stars” in action. An organ crawl in the College Hill area will be part of the 3rd Annual ArtDOG fundraising events. Venues and times will come at a later date. We will close our year with our annual picnic and Scholarship Library music sale in June. All of these events can be found in the newsletter and our website. Updates can also be found on Facebook. This looks to be another great program year, offering events for organists of all ages and choral friends. Put these events on your calendar and plan to invite your own congregations, choirs your are part of, social groups, and all the friends and colleagues you can think of! 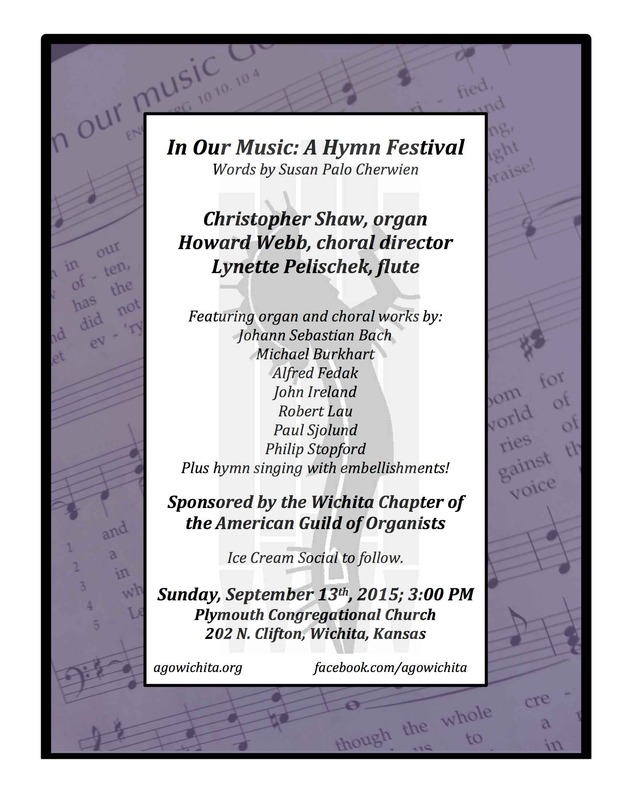 I hope to see you at our events this year, including the Hymn Festival on September 13th!